Basil Parmesan Squash Noodles with Pine Nuts is a healthy, easy to make, one-skillet recipe that cooks in right around fifteen minutes. It is perfect served alongside chicken, fish, or one it's own as a light main dish. Apparently when I got it, which was quite a few years back, it came with an attachment that I must have thrown in a drawer and forgot about. I only know this because we moved into a new house this past summer and I discovered it during the move. To my surprise (and joy) it is a plate the makes thin strip-like slices that are kind of like noodles! Now I'm a zucchini and squash noodle making fool. I'm sure you've heard of zoodles, right? These are those. I like to dress mine up with a Italian flavors. I use pretty much everything you would find in a pesto, just deconstructed a bit. So flavorful, so fresh, a so super easy to make. I actually just ordered a spiralizer attachment for my Kitchen Aid and I can't wait to try this recipe with it! No spiralizer or mandolin? No problem. Just bust out the old knife skills and cut that squash up into noodle shape. These are my new fave! Heat a large dry skillet over medium heat. Add the pine nuts to the pan and cook, stirring often, for 3-5 minutes or until golden. Transfer to a small bowl and set aside. Raise the heat to medium-high and add the olive oil to the hot skillet. Add the squash noodles and saute for 2-3 minutes, stirring occasionally. Add the garlic to the skillet and continue cooking for 1 more minute. Pour a glug of wine into the skillet (you can eyeball it and pour straight from the bottle, around a 1/4 cup or so) and continue cooking until the liquid is evaporated. 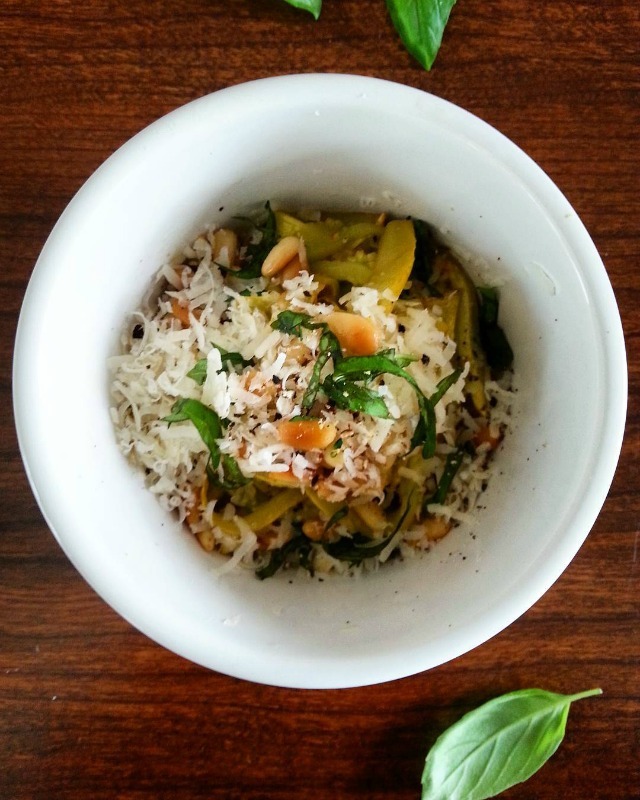 Transfer to a serving bowl and top with the cheese, toasted pine nuts, basil chiffonade and ground pepper. This recipe is pretty flexible as far as the amounts of the ingredients. Squash varies in size, so mine might be much larger than yours. Just use an amount that looks like it will fill your pan without it overflowing. Same goes for the wine and cheese. I just pour a little wine in the pan and grab a handful of cheese for on top. Garnish to suit your preferences. Basil chiffonade: lay 4 basil leaves flat in a stack. Roll up and thinly slice the roll to make thin strips.